Times of great change quite often bring times of great opportunity. While the ice storm of December 22 was a frustration for many, and a tragedy for some, it also can be a moment that brings about great opportunity for many – especially some of the businesses in Emery Village. Businesses in the GTA, and Emery Village that provide plow services will see more demand than most seasons, simply because of the wealth of work available. Salt sales, for driveways and sidewalks, stairs and paths, have set seasonal records for GTA retailers, creating demands three and four times as high as past seasons. The City of Toronto has said that its own ice storm costs will reach approximately $106 million, with city manager Joe Pennachetti stating the city has approximately $30 million set aside in extreme weather reserves. And that number only represents the clean up of publicly owned property. As the city dealt with approximately 300,000 people without power, and winds and ice rain that took approximately five to 20 percent of the City’s trees according to some reports, municipalities are beginning to look for solutions for residents on fixed incomes and those who may face physical difficulties cleaning their own yards or families. The bill for the private cleanup will be high. So high in fact, the estimates are not out. Trees continue to litter backyards, get stacked in sheds and gardens and line laneways while private citizens deal with businesses struggling to keep up with the work. Retailers have responded to demand for salt by leaning on their relationships with suppliers, and the building of new relationships and partnerships will be one way the retailers and service providers of Emery Village can increase their own productivity after, and because of, this city wide disaster. Landscapers who offer plow services in Emery, like Accent Green Landscaping, and Cameron Landscaping, have no doubt seen an increase in off hours calls, requests for increased or emergency services, and perhaps, been stressed at times to service all of the demand. Kooy Brothers, a large operation on Wilson Ave., may be equipped for an increase, but could even a larger operation be prepared for 400 and 500 percent increases in customers? “Neighbours are encouraged to help each other, or hire a contractor,” reports the City of Toronto website. In other words, the city will be there, but in time. Efforts will be made by our government to assist residents, but likely, they will be working on their own cleanup for weeks, and likely months. It is time for the businesses of Emery to take advantage of everything available. 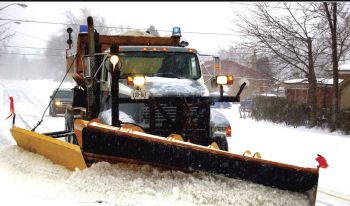 Do you have more calls for plowing than you can service? But you have an excess of road salt product that you aren’t using because your clean up crews are focusing more on tree debris calls than sidewalk and laneway restoration calls? Then maybe it is time to pick up the phone and build a quick working relationship with your competition. Rather than disappoint the callers you cannot service, what about sharing some of your work in order to score more, as well as build a local partnership that may serve you in the future? “Small business owners often choose a sole proprietor business structure when starting up. The road to entrepreneurship can lonely. Greater rewards may result from forming a business partnership. Partnerships offer more freedom for business owners with shared business tasks and the potential to earn greater profits. During times of crisis, we learn to work together as people. As businesses we can do the same, and benefit each other through sharing of work, ideas and product,” said Darrell Zahorsky in his article creating a winning business partnerships for About.com. “The ice and extreme cold weather have caused some equipment, machine and vehicle failures as well as service disruptions,” said a GTA blog about ice storm clean up efforts. It’s a justifiable explanation for recovery delays, but also an open door for equipment suppliers. Reach out, even in cold call style, to those who will see equipment and staff overstretched. Even communicators will be struggling to find time during the chaos of the clean up, and even a volunteer of your equipment or service could lead to a relationship with your municipality that sees you closer to landing a contract in the future, or increased sales. This can be especially advantageous for small businesses that may struggle to answer to all the demand they are seeing. Are you a small plow operation with only two trucks? Than you may not want to put yourself to work 100 per cent during the busiest of times. Save your extra energy for now, the post chaos cleanup. Organize extra hours and build relationships while those you are networking with will have the mental capacity to remember your name, the job you’ve done, and the quality of work you’ve put forth, instead of forgetting you among the hundreds of others they’ve been coordinating. Do one thing, and do it extremely well. Use the time of crisis to show your ability at what you do, not contribute to the chaos. The City of Toronto is already on record stating that most of the tree replacement work will occur in 2015 and beyond, as they focus on cleanup of debris for now. If you are a small landscaper or service provider who has already expanded into plowing to answer to the increased demand in 2014, it may be prudent to explore other expansions, as the ice storm cleanup will be so extensive it will no doubt include a number of phased projects during the next few years. Although it is an international example, Japan is showing the way after earthquakes ravaged its cities. “Case studies were presented on how the Japanese private sector has used core business partnerships to enhance disaster risk reduction and finance the country’s rebuilding after the recent earthquakes. Presenters outlined the role of Philippine business owners in strengthening disaster preparedness and resilience, including by synthesizing collective knowledge. The history of public- and private-sector cooperation in San Francisco in facing such past and future threats such as rising sea levels and heat waves was also explained,” it read. “Although the relationship between the public and private sector has not always been one of trust,” said Caroline Woolley, EMEA Risk and Property Practice Leader at Marsh, UK, it was being improved as the private sector shared its insurance expertise, warning systems and relevant technologies with communities. A message for Emery. In times of crisis, we can all benefit through the sharing of services, product and technologies.